A Tribute to Blacklisted Lyricist Yip Harburg: The Man Who Put the Rainbow in The Wizard of Oz His name might not be familiar to many, but his songs are sung by millions around the world. Today, we take a journey through the life and work of Yip Harburg, the Broadway lyricist who wrote such hits as “Brother, Can You Spare a Dime?” and who put the music into The Wizard of Oz. Born into poverty on the Lower East Side of Manhattan, Harburg always included a strong social and political component to his work, fighting racism and poverty. A lifelong socialist, Harburg was blacklisted and hounded throughout much of his life. We speak with Harburg’s son, Ernie Harburg, about the music and politics of his father. Then we take an in-depth look at The Wizard of Oz, and hear a medley of Harburg’s Broadway songs and the politics of the times in which they were created. OZMA OF OZ to Round Out Playwrights Foundation’s Rough Readings Series The Playwrights Foundation’s 2013 Winter Rough Readings Series concludes with readings of Rob Melrose‘s adaptation of OZMA of OZ on Monday, December 2, 7:30pm at Roble Hall, Stanford University and on Tuesday, December 3, 7pm at The Thick House, San Francisco. Directed by Rob Melrose, OZMA of OZ is a trip-hop musical based on L. Frank Baum‘s third book in the Wizard of Oz series and presented in partnership with Cutting Ball Theatre. OZMA of OZ features music by Bay Area electro-rock group Z.O.N.K. giving the piece its own 21st Century San Francisco spin. ‘Wizard of Oz’ authorities to sign 75th anniversary companion book at Barnes & Noble Jay Scarfone and William Stillman, historians and collectors of all things “Oz” for four decades, have just produced “The Wizard of Oz: The Official 75th Anniversary Companion.” In their introduction, the Pennsylvania residents recall becoming enamored of the film in the 1960s and 1970s, thanks to watching annual TV broadcasts with family. Between viewings, “we’d search for tangible reminders of that happy experience,” and so their collections started with picture books, soundtracks and figurines. The authors will sign their lavish $40 hardcover from 6-8 p.m. Friday at Barnes & Noble Booksellers, 1700-H Fruitville Pike. Camden Public Library hosts an evening with ‘Oz’ expert John Fricke The Camden Public Library is participating in the nationwide celebration of all things Oz by hosting the world’s leading expert on “The Wizard of Oz,” John Fricke, on Thursday evening, November 14 at 7 p.m. Fricke is the author of “The Wonderful World of Oz: An Illustrated History of an American Classic,” being published this month by Down East Books. Fricke’s presentation will celebrate the Maine launch of the new book and offer a very entertaining evening for all in attendance. 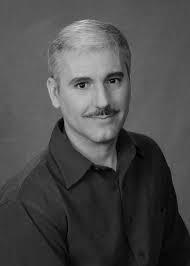 In addition to John Fricke’s appearance on November 14, the library will produce “A Wicked Event” on November 21 at the Camden Opera House with Gregory Maguire, author of the “Wicked” series which inspired the Broadway musical. 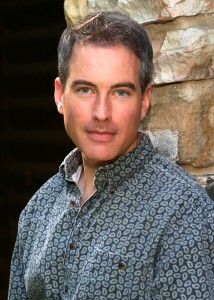 Tickets are available at the Camden Public Library and online at librarycamden.org. The library will also display the original Tik-Tok Robot from the Oz collection of Tom Wilhite and Willard Carroll, as well as iconic life-size Oz cutouts, posed for photos throughout the month. 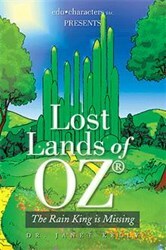 Janet Kelly Offers a Series of New Adventure Stories “Lost Lands of OZ” begins a series of new and exciting adventure books exploring the mysterious land of OZ which was originally created by L. Frank Baum in the early 1900s with the “Wizard of Oz” and 13 others authored by him. edu•characters has created a fabulously unique map of the contemporary OZ and the first book in the series, “The Rain King is Missing,” is an original story based on the amazing geography, the magical places, fascinating characters and unbelievable things that Baum created in his timeless books. Readers are introduced to the beautiful fairy princess, Ozma, who is the real ruler of OZ. Although only 16 years old, Ozma is the most omniscient and omnipotent in all of OZ. She fairly rules over the land of OZ with Glinda, the good witch. However, today evil clouds hang over Emerald City. Wicked forces in the Outer Lands of OZ are trying to take control of the magical kingdom by capturing the Rain King. BOOK REVIEW: “The Wizard of Oz – The 75th Anniversary Companion” This new book is filled with fun facts and tidbits such as this concerning all of the actors, and touches a bit on the “hanged man” scene and takes a look at cut out segments of the film like “The Jitterbug” number. “The Wizard of Oz 75th Anniversary Companion” is a lavish book written by Jay Scarfone and William Stillman, and designed in close collaboration with Warner Brothers. This is an over the top, above and beyond, Anniversary edition. One hundred and seventy-six pages hardcover coffee table book perfect for Ozophiles, film buffs, and fans of the movie. There is a forward by Caren Marsh-Doll (Judy Garland’s stand in for the film) and then an introduction by the authors. The book opens up with an entire section on the book series and Lyman Frank Baum. It then blends into MGM obtaining rights. From there it is a feast for all the senses; old photographs and promotional stills are blended with fascinating facts and stories about the director, actors, stage hands, camera men, anyone and everyone who had a hand in making this film. Follow the Yellow Brick Road to Farnsworth Art Museum Some of these items, like the witch’s hourglass or an early version of Dorothy’s blue gingham jumper, are the movie equivalents of religious relics: objects that go beyond mere nostalgia to something like transcendence. The most famous item associated with the movie, a certain pair of ruby-red slippers, aren’t here. They’re at the Smithsonian National Museum of American History, in Washington, D.C. What is here are ruby-red slippers worn in the 1985 film “Return to Oz.” A shooting script for “The Wizard of Oz,” with a dress tested by Judy Garland for the movie and the blouse she wore during the first two weeks of filming. A shooting script for “The Wizard of Oz,” with a dress tested by Judy Garland for the movie and the blouse she wore during the first two weeks of filming. The script and hourglass and dress are the stars of the show. But what may be the most illuminating items are some of the ephemera from throughout the Oz canon: soap, an Oz-themed box of Whitman’s candy (do the original contents remain inside? ), playing cards, a board game, dolls, wallpaper, buttons, and so on. Munchkins tribute at Woodridge ‘Wizard of Oz’ showing A celebration of the classic film “The Wizard of Oz” is happening this weekend at the Hollywood Boulevard Cinema in Woodridge. A special tribute to the munchkins features costumes and memorabilia. There are only two surviving munchkins, ages 93 and 95. They no longer travel so fans celebrated in their absence. 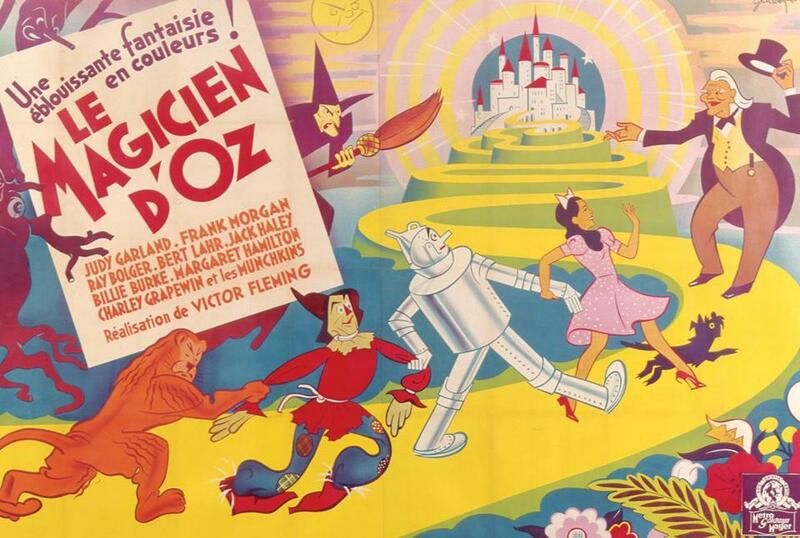 And of course “The Wizard of Oz” is being shown on the big screen in 2D and 3D.